Summer 2017: Thesis Defence & Celebration... Have Baby!! Because parents have been found to ultimately influence the degree to which their children have contact with the natural world (Chawla, 2015; Clements, 2004; Louv, 2005, Rivkin, 1998; Sobel, 2008), the parent-child-nature relationship (PCNR) was identified as the main area of interest for the research reported in this thesis. Family nature clubs have been recognized as platforms from which to achieve the parental engagement critical in fostering contact between children and natural settings and to nurture children’s interest in and concern for nature. 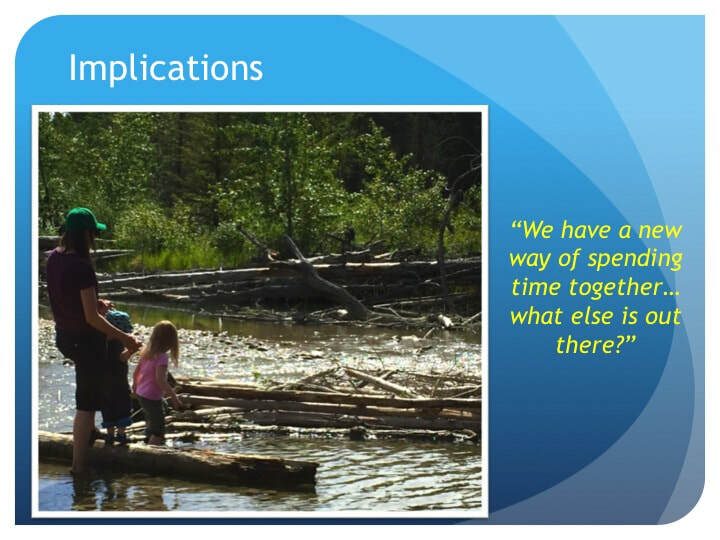 Qualitative research approaches were employed to study the PCNR during an eight-week case study of a family nature club that included 11 participating families. The study was grounded in phenomenological and ethnographic methods including entry interviews, field observations, parents’ journal reflections and a concluding focus group. The observations and self-reflections made by the parents during the period of the case study provided new insights about the value of experiences in nature for their children and families and included developing an appreciation of nature as a safe partner in their children’s experiences and of the importance of following the child’s lead in the process. The results that follow on this page are a summary of key concepts and take aways from the case study. Quotes shared are from journal reflections and focus group transcripts contributed by case study parents. The full thesis is available by clicking here. An element of surprise was often associated with parental observations around this edge of the relationship. Ultimately, parental observations revealed that the young child is a competent explorer of the natural world requiring minimal adult guidance. 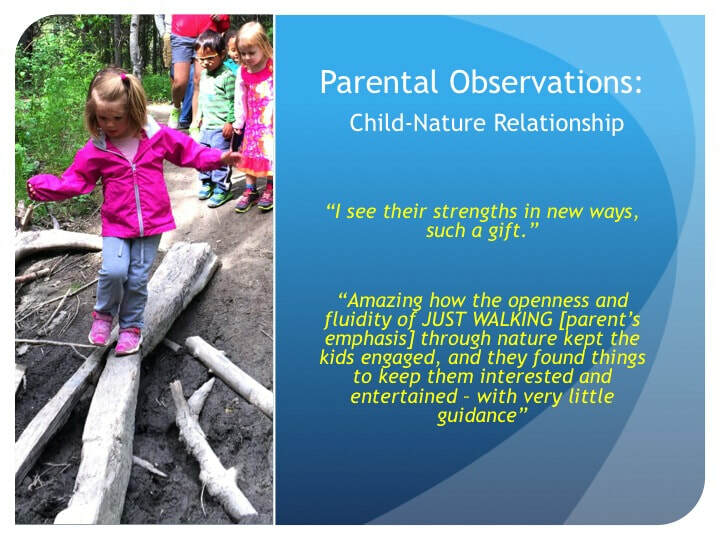 As a result of the frequency to which all parents shared observations around the child-nature relationship, this relationship is indicated to be at the heart of the PCNR experience. Often parents commented on a freedom from day-day distractions or the “adult world” (as unique to outdoor experiences) resulting in a grounding effect and a heightened sense of observation. The effects of the parent-nature relationship for parents is identified to be a key element to the PCNR experience as it provided parents the opportunity to be more present in the experience with their child. 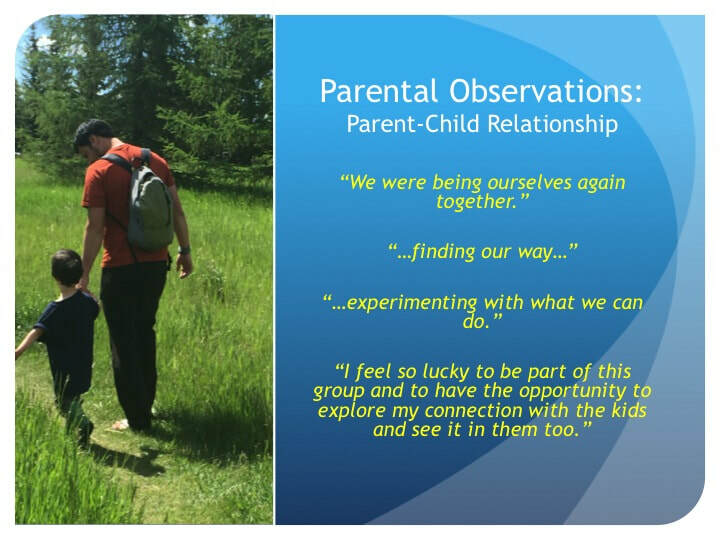 Observations around the parent-child relationship demonstrated how nature as a partner can support the parent-child dynamic by providing an authentic experience, a sense of accomplishment and building connection between parent and child. 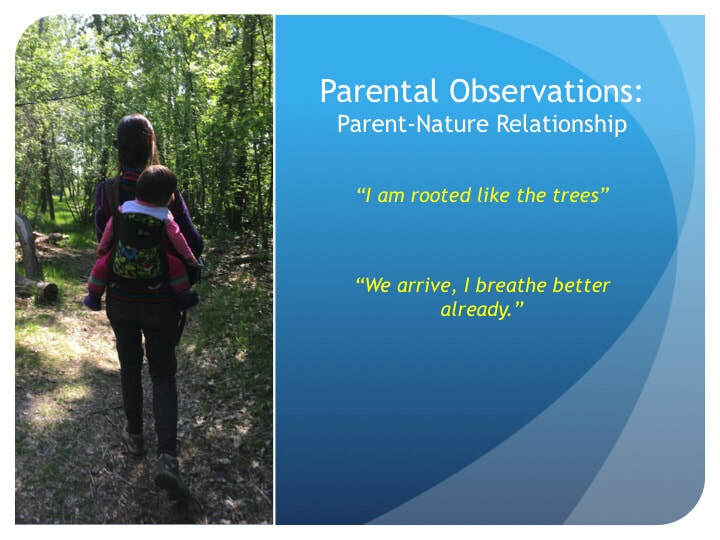 ​As a result of what parents observed around the three edges of the PCNR parents developed new insights around how nature is a valuable partner in their family experience. The Pack Effect + Mixed Ages was observed to increase group confidence, boundary testing and exploration of nearby nature such as wildlife habitats. 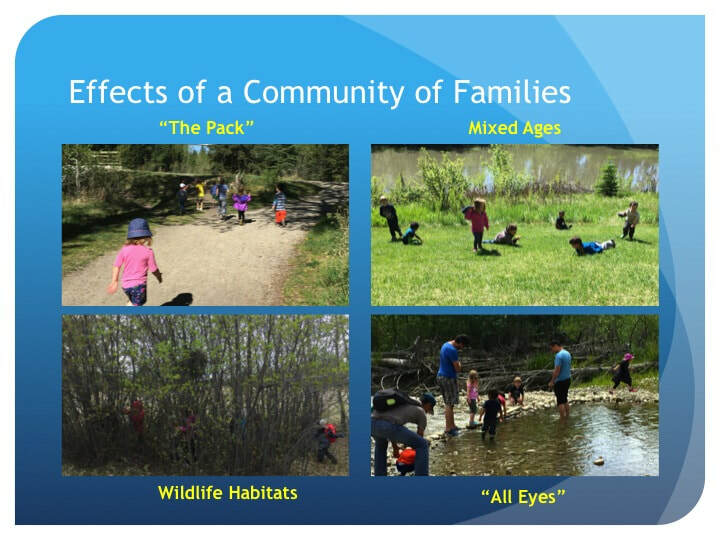 “All Eyes”: A sense of “all eyes” of a community of parents was identified as an important element in increasing parental comfort with the rapidly unfolding nature play occurring during the case study, especially near water. 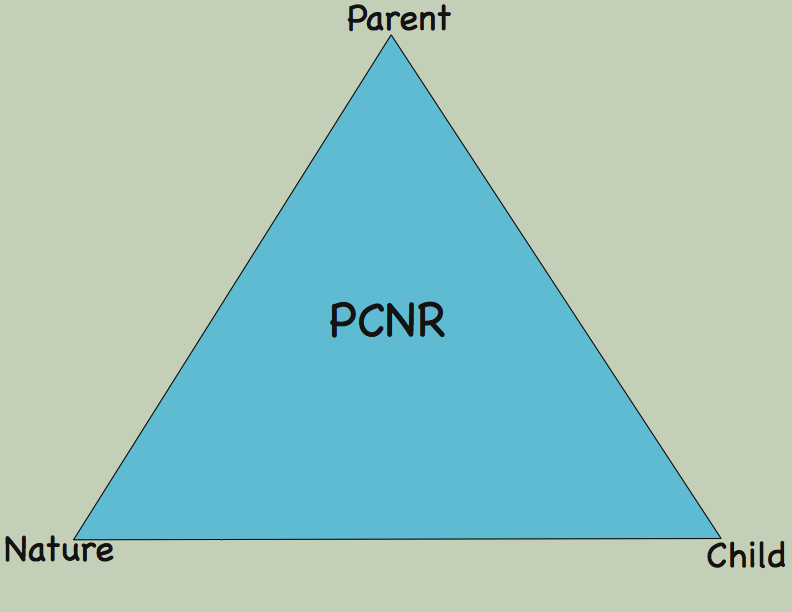 ​Parental observations, insights and the effects of a community of families all contributed to the three key principles of the PCNR identified by parents during this case study. These three principles indicate a sense of increased capacity and desire for parents to provide more unstructured experiences during nature play for their children — which has been identified as an increasingly missing aspect of childhood today. May we continue to explore a connection to ourselves, to each other and to the natural world through our urban wild adventures and beyond! ​Shaun: Thank you for always recognizing and believing in the value of my ideas and dreams even when I have had doubts. Family, friends and Nonna: Thank you for your caring hearts and hands supporting my family during the three residencies I was away and throughout the years. Urban Wild Families: Thank you for inspiring me with your diverse insights into how nature as a partner supports our families. I hope to cross paths with you in the urban wild again soon! Thesis Committee – Thank you to my Committee Supervisor, Dr. Cheryl Charles, and my Committee Member, Dr. Milton McClaren, for providing me with the language and tools to dig into the heart of this thesis. Most importantly, thank you for your trust and encouragement to keep going. Royal Roads University and the 2014 Cohort – Thank you for a community of people who reminded me about the importance of ideas – having them, sharing them and growing them. I hope to co-inspire with you all in the future.